Sir Speedy Printing and Marketing Service in Olathe, Kansas becomes the first Sir Speedy franchise to sign on for WrapMail. 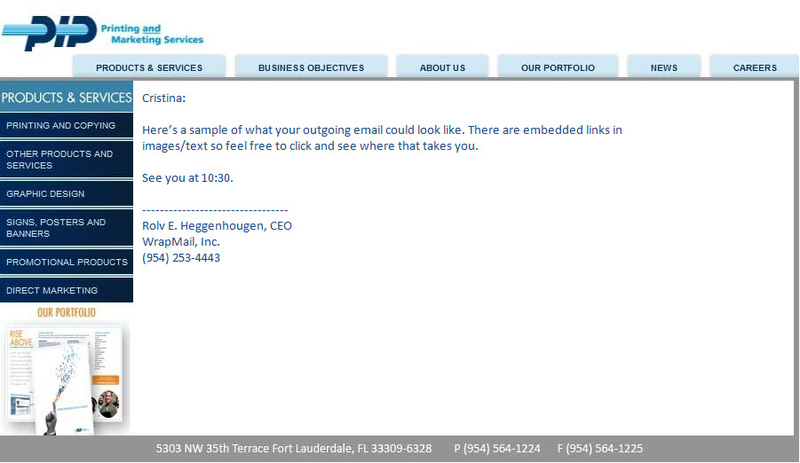 They follow PIP Printing in Fort Lauderdale as the second FranServ franchise to implement WrapMail to promote all their products and services in the regular emails sent by the employees every day. FSI franchises include Sir Speedy, PIP, Signal Graphics, TeamLogic IT, and MultiCopy in Europe. Example of wrap currently used by Jan Geller, owner of PIP in Fort Lauderdale, FL. If you’re interested in promoting your business via email but don’t plan to use an email service provider such as Constant Contact, you may be interested in a new company and product called WrapMail. We recently learned about this product and, although we have not tested and thoroughly reviewed it, it seems to be a useful and inexpensive tool for promoting your business and website. WrapMail takes an ordinary email from you or anyone in your center and places a custom-designed branded border or wrap around your message that can contain links directly to your local website. It can be used as a branding tool or advertising medium. The service is flexible enough that individual users have the option to use or not use the wrap and if you have several wrap designs, decide which one they want to use at any given time. WrapMail wraps the outgoing emails in up to four frames with pictures, graphics, text, links and/or audio and it does this on the server level so there’s no need to change any routines on the desktop (the sender does not see the wrap). The best feature of WrapMail is that if you add a link to your local website, you will be able to track the number of visitors to your site from your emails. The WrapMail service is $5 per user per month plus a small installation fee. Our only word of caution about this product to date is if a recipient has disabled HTML in their email client they will not see the wrap but only get the text you sent. If you’re interested in learning more, visit the WrapMail website at http://www.wrapmail.com or contact them at 954/253-4443 or sales@wrapmailinc.com; or contact Denise Denton, FSI Director of Marketing Communications, at 949/348-5141 or ddenton@franserv.com. The first PIP franchise signed on with WrapMail yesterday. They will use WrapMail to brand with every email sent by employees and focus on the many cross-selling opportunities this gives them.